The Republic of Argentina is located in the southern, western and maritime hemisphere. Its territory comprises a South American continental part, islands and a sector of Antarctica. The Argentine Antarctica lies between 25º and 74º W and south of 60ºS down to the South Pole. South American continental space: 2,791,810 km2. Most of the economic activity is developed in this area. Antarctic continental space: The population living in this territory belongs to scientific bases and family groups. Its area is 969,464 km2. The Argentine territory, in the southern tip of the South American cone, enjoys a great climatic diversity due to its wide latitude, which includes both the Tropic of Capricorn and the geographical South Pole. Its different climates and the presence of agricultural lands place our country in a privileged position as regards diversified extensive production, especially grains and oil-seeds. For the same reason, it has sectors with excellent natural prairies for cattle raising. Argentina contains a wide range of social-economic spaces. 80% of the economic activity is concentrated in the "litoral-pampeana" region (littoral-plains), and 45% of the territory is located in a warm climate zone. This imbalance is also reflected in population distribution and density, as 30% of the inhabitants are concentrated in 0.1% of the territory. Patagonia, with 4%, is the least populated region, though it comprises over 28% of the total area of the country. This vast territory shows particular geographic environments which, coupled with population density asymmetries, create important geopolitical gaps. Its environmental characteristics, population distribution, empty spaces and the present layout of the communications system have caused distant regions to develop their own activity, disregarding economic centers and tending towards self-supply. The geological features of the Argentine continental shelf - of continental and insular nature - are suitable for hydrocarbon generation and trap formation, and for the eventual exploitation of polymetallic nodules. This makes the platform a future economic factor, which leads to the need for its preservation. Several groups populated what is now Argentina at the beginning of the 16th century: Tehuelches, Rehuelches, Rampas, Matacos, Guaycures, Huerpes, Diaguitas, Mapuches,etc. When, in the early 16th century, the first Europeans came to Argentina, the Native Americans had already halted the Inca drive southwards from Peru through Bolivia into northern Argentina. The Spaniard Juan de Solís landed on the shores of the Plata estuary in 1516, but the Indians resisted to his conquest intent, he was killed and the expedition failed. Magellan touched at the estuary four years later, but turned southwards to winter on the Patagonia´s shores, after that he discovered the strait that connects the Atlantic and Pacific oceans. In 1776 the Viceroyalty of Río de la Plata was created-including today's Chile, Paraguay, Argentina, Uruguay and part of Bolivia- with Buenos Aires as its capital. On 25 May 1810, the cabildo of Buenos Aires deposed the viceroy and announced that it was governing henceforth on behalf of king Fernando VII, the captive of Napoleon. Representatives of the various provinces convened at Tucumán in March 1816. On the following July 9 the delegates proclaimed independence from Spanish rule and declared the formation of the United Provinces of South America (later United Provinces of the Río de la Plata). By the beginning of the 20th century Argentina had become one of the richest countries in the world, and its population had been boosted by the arrival of millions of Europeans. Civilian rule was generally peaceful and stable until a military coup in 1930. Another coup occurred in 1943, after which Juan Domingo Perón, a key figure in the coup, emerged as the country's leader. He encouraged the growth of labour unions and raised wages, and in 1946 he was elected president. Perón and his wife, Eva ( Evita ), who was a champion of social welfare programmes, were immensely popular among the masses, but as the economy deteriorated Perón became increasingly autocratic. His efforts to secularize the nation brought him into conflict with the Roman Catholic Church and alienated his military officers; he was overthrown in 1955. After a series of military governments, Perón was allowed to return to power in 1973, but he died in 1974, leaving his second wife, Isabel, who had no political experience. Isabel led the military to take power in 1976. The army then embarked upon its own "dirty war" against those it considered subversive; thousands were murdered or disappeared. Since 1983 until now, Argentina has a democratic government. Actually, Mr. Kirchner took office as Argentina's new president 25th May 2003. Consolidating democracy and starting a new era for the country. Argentina is a federation of 23 provinces, plus the Federal Capital District (Buenos Aires City). In the years since 1983, the country's democratic institutions have achieved unprecedented stability, and military intervention no longer appears even a remote prospect. The system of government (at both the federal and provincial levels) is based on the “separation of powers” into 3 distinct branches: the Executive branch, the Legislative branch and the Judiciary. No member of one branch of government can simultaneously perform official duties in another. At the Federal level, the Executive branch comprises a President, a Vice-President and a Cabinet of Ministers. The President and Vice-President are chosen by direct popular vote for a four-year term. One consecutive re-election is permitted. The ministers are appointed by the President. The main responsibilities of the Federal Executive branch include: general administration of the country; application and enforcement of federal laws; issuing of “Emergency Decrees” in place of congressional legislation if required; negotiating and signing of international treaties and agreements; management of customs; collection of federal taxes and duties; management of armed forces. The Federal Legislative branch consists of a bicameral Congress. The two houses are the Senate and the Chamber of Deputies. The Senate is made up of 72 senators: 3 per province, chosen by the respective provincial legislatures, and 3 senators for the Federal Capital District, chosen by direct popular vote, all for a six-year term. The Chamber of Deputies is made up of 257 deputies, chosen by direct popular vote for a four-year term. The Federal Judiciary is made up of trial courts, appeals courts and one Supreme Court. The Argentinean Cadastre completes an important role in society and had a long history of development over many years. It has advanced significantly and expansively over the last few years due to the technological advances in geo-information on the one hand, and to the possibilities of realising cadastral development projects that have been carried out in the majority of provinces, either with World Bank finance or provincial contributions. The implementation in the cadastres of Land Information Systems, orientated toward the multi-purpose cadastre, has increased their potential significantly in respect of the services they provide to society. Consequently, many opportunities and challenges are foreseen in the future. The agencies responsible for Land registration and for cadastral survey depend on provincial government. Cadastral organizations depend of different Ministries according the Province. Ministry of Economy and Finances. Ministry of Finance, Works and Public Services. Ministry of Economy, Works and Public Services. Secretary of Urban Planning and Environment. State Secretary of Economy, Finances, Works and Public Services. Ministry of Works, Public Services and Environment. Ministry of Economy and Public Services. Cadastre and Land Information Service. Ministry of Works, Public Services. Regarding private sector involvement we must point out that parcel, division, unification, amalgamation, land consolidation and other cadastral operations, are carried out by private land surveyors and registered in the cadastral organizations. Equivalent procedures are carried out by notaries, who carry out deeds, easements, mortgages and other documents regarding land. The Cadastral Federal Council is the body integrated by 24 members, corresponding to the cadastral organizations of all the (23) provinces and the Autonomous City of Buenos Aires. Because the cadastral organisations are located in the provinces, there are also institutions in each province that embrace professionals involved in cadastral tasks. Such institutions are integrated in a national body called FADA, that is a member of FIG. FADA is made up of approximately 3,500 professionals in all the country. There isn’t specific licensing regime for cadastral surveying professionals working in the cadastral system. University degree is required. The provinces have delegated control of the professional activities in institutions integrated by the professionals of their jurisdictions. Such institutions, that are FADA’ members, verify the required conditions for carrying out professionals’ tasks. There is one Institution for each province and one for the autonomous city of Buenos Aires. In some cases they group together land surveyors, engineers and other related professions. There are twelve Universities offering the degree of Land surveyor. Approximately five students per University graduate each year. Cadastral system covers the following roles: legal (land transfer, land market), fiscal (land valuation, land tax), and multiple purpose role (planning, local government). As each province has its own cadastre the emphasis in the roles mentioned above vary according to the province, mainly in the multipurpose one. As Argentina is a Federal Country there is a Provincial Cadastral Organization in each province and in the Autonomous City of Buenos Aires. The scope of the cadastral systems of the province has been mentioned above. The multipurpose role of cadastre is complemented mainly by municipal cadastres according to the provincial organization and development. The concept of Cadastre in Argentina can be considered equivalent to the definition given by (FIG, 1995). Parcel is the common registration unit for cadastres in Argentina. It is all land parcel division, unification, amalgamation, etc. must be registered in the cadastral organization. Also horizontal property units are registered. Cadastral maps cover basically urban and rural areas. Urban maps have mainly geo-reference, administrative and parcel boundaries, buildings and complementary improvements. Rural maps are basically integrated by geo-reference, administrative and parcel boundaries and topographic data. 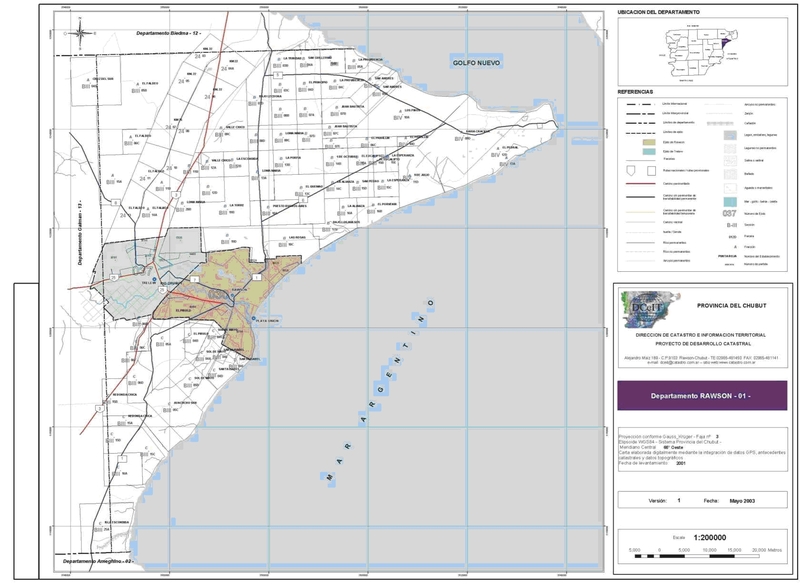 Example of rural cadastral map is illustrated with one of the provinces (Chubut). Role of cadastral layer in SDI is considered in the last few years. Cadastral Federal Council, FADA and other organizations, make an effort to disseminate the importance of cadastre as a fundamental component for the SDI development in the Country. Taking into account the proposed solutions for such problems, in 2002 the Cadastral Federal Council and FADA presented a Project of National Cadastral Law. This project includes the role of cadastre as a fundamental component for the SDI development in the Country. Complete the development of the Land Information Systems started in the 90’s and carried out through World Bank loans in most of the provinces of the Country. Guarantee the sustainability of the Land Information Systems. Overcome the identified problems by the provinces in a survey carried out for the Cadastre area of the National office of the Interior Ministry. Strengthen the Cadastral Federal Council in order that it can comply with a wider range of requirements. Make efforts in order to achieve, as soon as possible, the new National Law of Cadastre. Disseminate the results of the above mentioned survey. Increase the coordination, cooperation and communication among cadastral organizations and related ones, in order to improve their capacity building. For drawing up the questionnaire, the following people and organizations contributed. Hilda Gismano (hgismano(at)criba.edu.ar), Coordinator of the National Council of Land Surveying Schools (CONEA). Topic of contribution, Education. Norberto Frickx (ingfrickx(at)arnet.com.ar, President of the National Federation of Surveyors), Topic of contribution, Professional Organization.